I don’t know about you, but working all the time, and only having a short lunch break (20-25 minutes) makes finding a suitable, fulfilling and healthily lunch difficult. Especially during the colder months. I never have time to leave work and go to a sandwich shop such as Pret-a-Manager, Boots or Costa Coffee, and I do not like preparing my own cold salads or sandwiches. So my latest thought has been soup. Home-made soup to be exact. Yes I agree it easier to buy a can of soup, but it is not as healthy, more expensive and less fun. So I make batches of soup, then portion them out into freezer bags, and freeze them. When I go to work I use the microwave to defrost them, and hey presto fresh home made soup to warm me up. Recently I’ve been enjoying a Lightly Spiced Carrot Soup which is filled with vegetables and spices – filling you with goodness! However I also enjoying making my own – especially ones which include root vegetables such as butternut squash. – Studies show that those who start their meal with soup consume up to 20% less calories on their next course – soup is very filling. – Soups which include leeks, onions and celery help fight fluid retention in the body – making you less bloated. 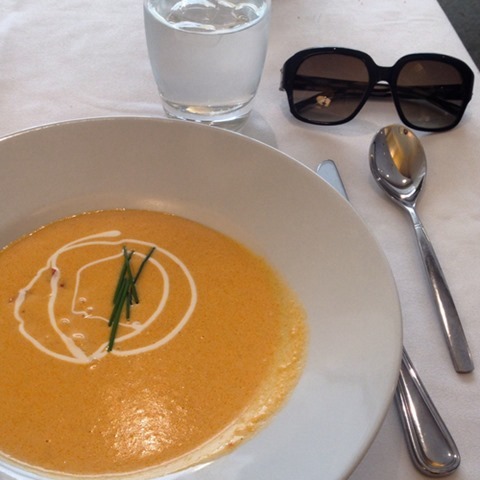 Which soups have you been enjoying recently? What is you go-to lunch during the colder months?